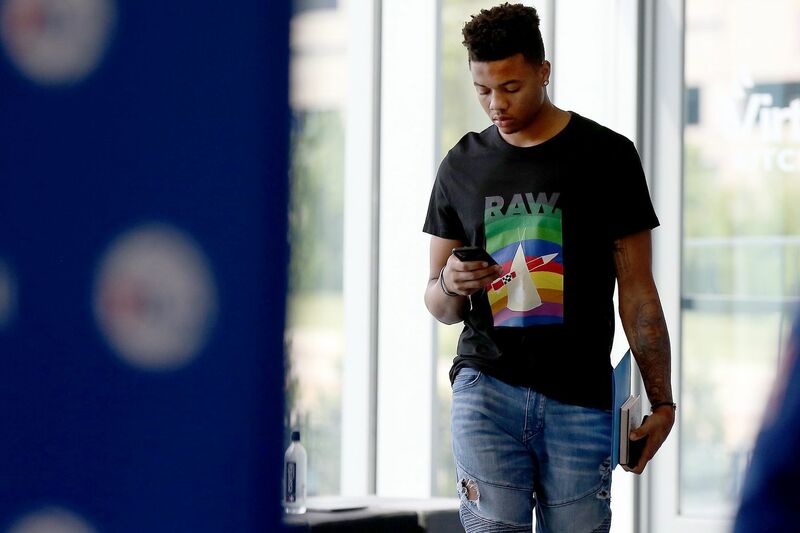 Markelle Fultz checks his phone before he talks to reporters at the Sixers' practice facility in Camden. The 76ers revealed Saturday that Markelle Fultz will not play for their NBA Summer League entrant in Las Vegas next week. The point guard will instead remain in Los Angeles to continue working with shooting coach Drew Hanlen. Sixers coach Brett Brown all but said on June 22 that Fultz would miss the summer league. The team wants him to regain the shooting form that made him the No. 1 overall draft pick in 2017. Fultz still isn't play a lot of basketball. The focus has been on his shot. The summer league starts Friday and runs through July 17. Brown said back on May 11 that he wanted Fultz to play in the summer league. That had a lot to do with the 20-year-old playing in only a combined 17 regular-season and playoff games. Fultz played in the first four regular-season games before being sidelined for the next 68 with what the team called a right-shoulder injury. However, his shooting woes were mental, according to several sources. After showing some improvement in his shot, Fultz returned in time for the final 10 games of the season. He played 4 minutes, 21 seconds in the first half of Game 3 of the first-round playoff series against the Miami Heat on April 19. However, T.J. McConnell took over the point-guard duties in the second half of what was Fultz's last playoff game. He played in the first two games of that series. Hanlen has confirmed what sources have told the Inquirer, that Fultz had the "yips" and "completely forgot how to shoot." The shooting coach and Brown have both said Fultz is making progress. "I think there's a timeline of that where you are going to start doing some things skill-wise and handle and play," Brown said. "But I think when you look at what's most important, what thing needs the most work, it's that. I don't really want to pivot out of that if we think it's going to hurt a very elementary way we are going about reclaiming his shot."